So much for my new year resolution of writing the company blog at least once a month! Despite no reporting on here of our activities Ian and I have been very busy promoting Independent Vision’s services to people with low vision. We have spoken and demonstrated equipment at a number of Macular Goup Meetings. 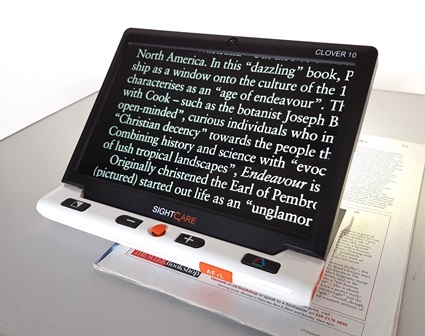 The emphasis of these talks is what to look out for when you are thinking of buying or hiring a video magnifier, what the descriptions such as High Deffinition (HD) mean and will having a high deffinition machine make any difference to what a person with low vision can see? At all the meetings everybody is invited to try the machines and encouraged to discuss their experiences of using video magnifiers. In addition to Macular Groups, Independent Vision has also spoken at Wiltshire Blind Association’s Moving on courses. We have increased our range of products and now have for hire or sale the I-loview 7 Full HD as well as the High deffinition Acrobats and Merlins. In the next few weeks we are attending the Wiltshire Blind Association AGM, where we are having a stand. We are attending Sight Village as visitors, we will be checking out the stands to see if there are any new products that we will want to make available to our customers. This entry was posted on Tuesday, July 2nd, 2013 at 11:09 am	and is filed under Magnifiers, Uncategorized. You can follow any responses to this entry through the RSS 2.0 feed. Both comments and pings are currently closed.